The division is responsible for investigating and prosecuting a variety of complex matters. Some of them include crimes committed by elected and appointed government officials. Examples of such cases involve misuse of public funds, political corruption and violation of election laws. The division also investigates and prosecutes allegations of criminal wrongdoing by government employees and law enforcement officers. 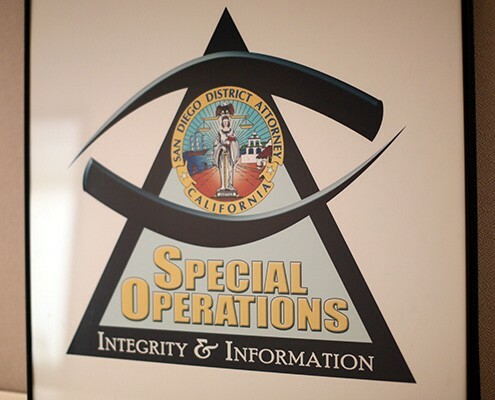 Special Operations investigates and prosecutes attorneys for crimes committed while acting in their professional capacity. Offenses committed against the justice system such as perjury and threatening a judicial officer are handled within this division as well. The unit also investigates and prosecutes hate crimes. The Crimes Against Peace Officers (CAPO) Unit was formally established in late 2013. The unit oversees all cases in the county where officers were victimized as a result of their duties. 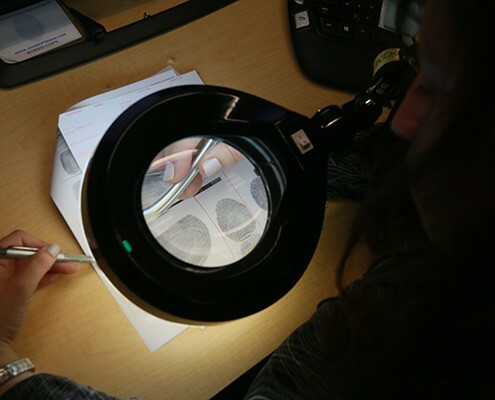 The CAPO Unit is led by an experienced prosecutor and investigator. There are 15 prosecutors assigned to handle CAPO cases throughout the county. In 2015, there were 2,028 cases filed in the county which included charges resulting from crimes committed against peace officers. Investigators who work with law enforcement agencies in Mexico and other countries are assigned to Special Operations. In addition, the division is responsible for background checks on potential employees and volunteers. In 2015 the unit completed 273 background checks. Duties include the independent review of all officer-involved shootings, which the District Attorney’s Office has done since the mid-1970s. The purpose of the District Attorney’s review is to provide an impartial analysis of all shootings and other use of deadly force by peace officers, fatal and non-fatal. The neutral and objective review determines if peace officers in San Diego County acted lawfully when they made a decision to use deadly force. Upon completion of the District Attorney’s review, a letter summarizing the facts and statements of the deputy or officer and other witnesses is written and delivered to the respective law enforcement agency. In 2015 the division reviewed 18 officer-involved shootings. The defendant in this case left a voicemail message on the phone of a Muslim civil rights group saying he had plenty of firepower and there would be a “big incident.” His message was laced with profanities and slurs against the Muslim religion. He claimed it would be like the Charlie Hebdo murders in Paris. The defendant also sent an email to the Washington DC office of the same group threatening to show up at the office with “plenty of firepower to kill every one of you…” Authorities found an AR15 rifle and a high capacity 30 round magazine during a search. The defendant pleaded guilty to making a criminal threat while committing a hate crime and possessing an assault weapon. He was sentenced to a year in custody and five years of probation. The defendant filed a claim against the city of Oceanside about a police officer who took an accident report involving the defendant. A deputy city attorney was assigned to represent the City for the claim. The defendant sent threatening emails to city officials. He also began to threaten the deputy city attorney in emails, including stating, even “cripples” could use a firearm. The defendant went to trial and was found guilty of stalking. He was sentenced to the maximum term of eight years in prison. A defendant drove a police car toward two officers, resulting in one officer being seriously injured. A defendant shot through a door as two detectives approached the room where defendant had hidden to avoid being apprehended for a murder he committed two days earlier during a robbery of a convenience store. A defendant grabbed an officer’s gun during a struggle and fired it causing the bullet to graze the officer’s pant leg. The officer narrowly avoided having his face slashed by a knife when defendant lunged toward him. The defendant received a prison commitment of 5 years. A county employee working as a maintenance man at a jail accepted an offer to help an inmate escape in exchange for a payment of $6,000. The employee helped the inmate escape, but he never received the promised funds. The county worker pleaded guilty to a felony and was sentenced to a year in jail and 5 years of probation.